On the second floor of a winemaker's home for 4/5 persons, first bedroom for 2 persons: king-size bed (160 cm wide), second bedroom: twin-beds (90x200 cm), small fully equiped kictchen ( microwave oven, refrigerator, hot-plate, pots and pans, dishes), living-room: one extra single bed (130cm wide), private flowery terrace. Free indoor parking for car and motorcycles. Rate fo rone night : 1 person 45 euros, 2 persons: 60 euros, 3 persons: 80 euros, 4 persons: 100 euros. For a week stay, the 7 th is free in any season. Opoul Périllos is 2 hours away from Barcelona via A9 higway. You can visit Figuers passed the spanish border and visit the famous Dali Theatro-Museum. 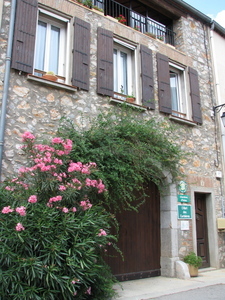 The Roussilon offers an exeptional patrimony to visit: Cathar Castles, Roman Monasteries like St Michel de Cuxa, St Martin du Canigou, and many others. The beaches are only 20 minutes away: Leucate, le Barcares, Canet- en-Roussillon, Collioure. The flowers of the garrigue will ravish your senses on your hikes or bike-rides. Interested in rock-climbing? A natural wall at the foot of the Opoul Castle is waiting for you. On the wine-tour, Opoul Shelters several wine-makers clever enough to elaborate excellent beverages. The Catalan cooking offered by many localrestaurants should satisfy your tastes. Welcom in Roussillon. By the A9 highway, exit 41, or by nationnale 9, take the D 15, then D 5. Once in Opoul, follow the TOUTE DIRECTIONS sing, then the CHAMBRES D'HOTES grenn nd white sings that will take you to n° 3 rue des Corbières.